to Shane Nicholson: Not really relevant to other clubs though - they don't gain anything from your home support. This was the general response from the non-RFC crowd to my infographic that compared the home attendance of Rangers to the combined home attendance of the 10 diddy clubs from SPL season 2011/2012. Our 46,500+ fans per home game last year matter not. Our ticket sales don't do anything for the other clubs. Our continued existence is irrelevant to the SPL, essentially. Well, today I could give sixteen-million reasons why that's not true, and was going to make another infographic to help drive that point home. Thankfully a few dozen people with some bedsheets made my case for me at Hampden this afternoon. I'm convinced I couldn't have illustrated it any better than that sorry site of 13 fans standing round the gates wondering when the cavalry would arrive. Who could have guessed that a couple-dozen donuts and a thermos of coffee would be enough to cater today's get together? How utterly embarrassing it must have been, standing there waiting for the masses of ravenous NOtoNewco FC supporters to show. It turns out Scotland's new favorite club travels about as well for a showdown with Rangers as the rest of the SPL. I'm not even sure it's fair to compare today's protest to ours a couple months back. 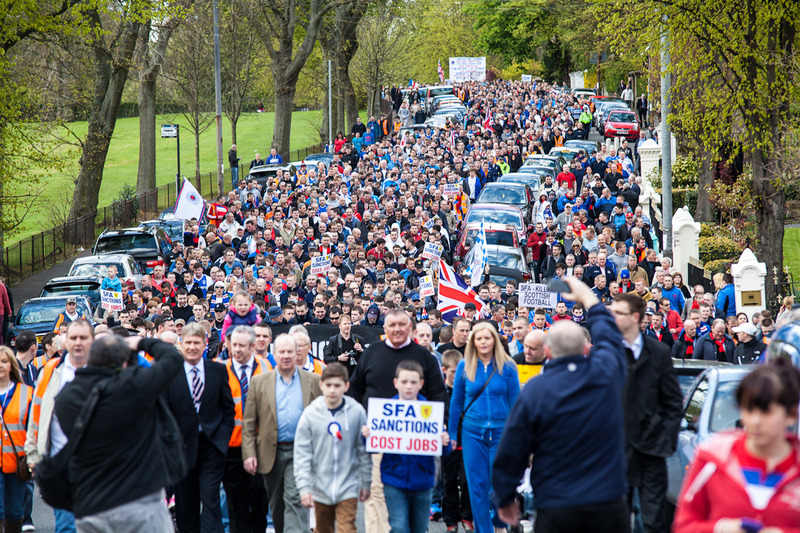 Of course we were going to send a big crowd to Hampden. While we travel in record numbers year after year--our supporters putting hundreds of thousands of pounds into the bank for the clubs who wish us to simply drop away from sight, not to mention creating an atmosphere in our ground that captivates even the most experienced of players from around Europe--most of them couldn't fill their own grounds with the turnstile numbers from two rounds of fixtures. Quite simply, we do everything better than you, even protests as it turns out. Better to learn it late than continue trying to prove us wrong. So today, I give a big thanks to the brave souls who made their opinions known at the home of Scottish football this afternoon. Sorry it didn't quite work out the way you planned; we certainly got some much needed comedic relief from your appearance. But an even bigger thanks is due to the thousands who couldn't be bothered to show up. At least we know now to what lengths you will go to make a statement that Scottish football will be just fine without Rangers around. I only hope the chairmen of your respective clubs took notice of how ready and willing you are to step up and be counted.